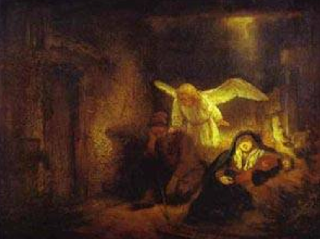 "The Dream of St. Joseph"
The angels were busy during the time of Christ's birth. That busyness started with an appearance to Zacharias to tell of John the Baptist's birth. Six or so months later the angel Gabriel came to Mary to tell her that she was the chosen mother of God's Son. When Mary's pregnancy became obvious, an angel appeared to Joseph reassuring him that the conceived child was of the Holy Spirit and he could go ahead and marry her. At Jesus' birth angels announced the news to shepherds. After the wise men visit we have the incidents we read of today where an angel warned Joseph to flee with his family to Egypt (Matthew 2:13). He got another angel visit when it was time to return home after the danger was past (Matthew 2:20). A divine visit even confirmed his fearful feelings about settling in Judea (Matthew 2:22). 1. They stand before God and worship Him (Matthew 18:10; Revelation 5:11). 2. They protect and deliver God's people (Genesis 19:1, 10-11; Acts 5:19). 3. They guide and encourage God's servants (Matthew 28:5-7; Acts 27:23-24). 4. They interpret God's will to men (Job 33:23; Daniel 7:16). 5. They execute judgment toward individuals and nations (Acts 12:23; Genesis 19:12-13). 6. They carry the saved home when they fall asleep in Jesus (Luke 16:22). — H. C. Thiessen, Lectures in Systematic Theology, p. 205-207. How comforting it is to know that God has an army of helpers at the ready to inspire, aid, shield, and guide us, to interpret God's will to us, and to help bring it to pass. PRAYER: Dear God, thank You for all the ways You minister Your providence, including assigning angels to work on my behalf. Amen. 2. Evident in the demon possession and demon worship in heathen lands. 4. The work of Satan and the evil spirits in hindering the progress of grace in our own hearts and the work of God in the world (Ephesians 6:12). — H. C. Thiessen, Lectures in Systematic Theology, page 190.